In 2014, this giant landmass of 1.3 billion people purchased barely 1,900 industrial robots. The Czech Republic, small as it is, bought 2,500! China, the world leader in robot buying, took in 56,000. By 2016, India’s numbers were barely 2,600, which were 400 fewer than Thailand. China’s industrial robot acquisitions soared to 90,000. With the rest of Asia already far ahead of India in embracing and committing to a future of industrial automation, such low robot deployments preclude India from joining the Asian automation club anytime soon. Officially, India is termed a NIC (newly industrialized country). NIC countries like Mexico, South Africa, Brazil, even China, are generally late to the game when it comes to industrialization. Thirty-five years of breakneck industrialization vaulted China into being the world’s factory. India, the other Asian behemoth, didn’t follow. Maybe being a NIC partly explains India’s sluggish pace of industrialization, which, in turn, might also retard the adoption of robots for automation…or maybe make it easier to bypass people all together and go straight for the robots. It may well be that before India can fully industrialize and put its millions of low-pay workers into factory jobs, robot-driven automation will have taken them away. It’s what Harvard economist Dani Rodrik dubs “premature de-industrialization.” All of the global industrialized countries had a period of time—decades—to industrialize before evolving to a post‐industrial phase of development and then into automation. Even with a sizzling GDP? ​China may have been the last to industrialize before things closed for NIC countries (newly industrialized countries); today NICs don’t get the chance to first industrialize before automation is on them to convert. And that’s exactly what Varroc Engineering, in Aurangabad, is doing. The maker of automobile plastics and lights is planning on buying robots as business expands. The inescapable good side of things for the time being is that with a sizzling GDP of 7.4—tops in the world—India is no slouch at pumping out its gross domestic product. Yet, best-in-world GDP can’t hide the fact that the country has horrendous levels of poverty, unemployment, underemployment and illiteracy—India has 280 million illiterate citizens. The average adult, according the United Nations, gets barely 4.4 years of schooling, lowest in Asia. Those millions of undereducated do not make for a compelling workforce, except for the most menial of jobs. Precisely the kinds of jobs at which robots are best. The face of a “new” India is clearly visible, yet will it emerge amid steep challenges? 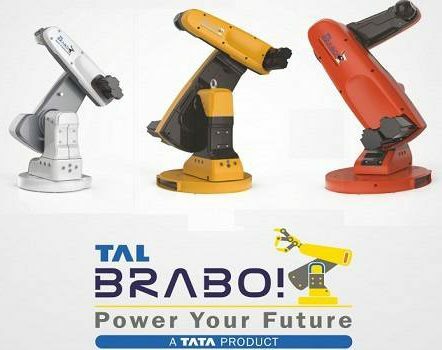 Can small, indigenous startups like Bharati Robotics get in on the action? Paradigm change: Should a large nation go small and can robots be major drivers in that process?